Because of the boost to the military, three progressive Democrats on the committee voted against the budget bill: Pramila Jayapal, Ro Khanna and Ilhan Omar. "This is a key philosophical moment for our party," Khanna said. The second-term congressman told the committee: "We cannot be against endless wars and then fund those wars." After the committee vote on April 3, I requested a statement from Congresswoman Lee. "I voted to advance a bill out of committee that sets budget caps for the next two fiscal years," she said. "To be clear: I do not support the Pentagon spending levels in the bill and voted for an amendment offered by my colleague Rep. Khanna to freeze Pentagon spending at FY2019 levels. Unfortunately, the Khanna amendment failed." Lee's statement added: "I have a long record of fighting to cut bloated Pentagon spending, audit the Pentagon and repeal the 2001 Authorization [for] Use of Military Force. I will continue to fight for these efforts, and to increase domestic discretionary spending as the budget and appropriations process moves forward." 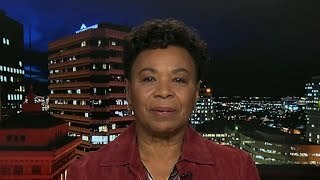 Certainly, Barbara Lee has been a stalwart opponent of endless war. Her tireless efforts to undo the AUMF have most recently included the introduction in mid-February of a bill titled "Repeal of the Authorization for Use of Military Force" (H.R. 1274). This is not the first time in recent years that Lee has succumbed to party-line militarism. Her notable anti-diplomacy tweet in July 2017 from the official "Rep. Barbara Lee" Twitter account -- denouncing President Trump for meeting with Russian President Vladimir Putin -- remains posted to this day. Yet her pivotal Budget Committee vote a few days ago is Congresswoman Lee's most tangible and disappointing assist to the military-industrial complex. Barbara Lee's sincerity and commitment to peace are beyond question. But it's all too easy for lawmakers to be unduly influenced by party leadership on Capitol Hill, where conformity is vital for the warfare state. Only pressure from the grassroots has the potential to overcome the business as usual in official Washington.